For over 55 years, Our new facilities located on our campus in Omaha, Nebraska, manufactures and packages many of the nations leading brands with science-based offerings in EPA disinfectants, cosmetics, nutritionals, pharmaceuticals and pet care products using only the highest-grade ingredients. We have four dedicated manufacturing facilities located on our campus. The reason we have designated our facilities is to utilize our campus structure for compliance and optimization of the specific manufacturing practices that occur in each facility. This is ABS Corporation’s primary headquarters for quality assurance & administrative offices.. This building is dedicated to liquid manufacturing and processing, filling liquids, gels, emulsions, tubes, pouches, grab-and-go type packaging, jars, bottles, and bulk for further processing. 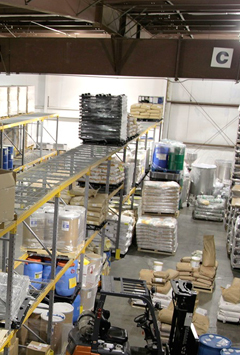 This section is staged for finished goods, freight, & shipping. This section is fitted with liquid feed packaging lines. This area is fitted with dry feed processing lines. Building Three is dedicated to dry manufacturing and processing, quality assurance, & contains areas reserved for light sensitive and/or humidity controlled manufacturing. This area is fitted with multiple formulation and packaging lines, which include encapsulation, tableting, powder filling, pouch filling, jar filling, and bulk packaging for further processing. This area is dedicated to agronomy manufacturing, agricultural production & new technology processing. This is ABS Corporation’s primary Contract Research Organization & sales offices. © 2018 ABS Corporation. All rights reserved.